ROB LIND (Sax Player, The Sonics): "Our whole goal was just to get people dancing immediately. We wanted a wall of sound; we wanted power. We always structured everything that way, and it just kinda evolved; we saw what worked. We were just a six-hundred-pound gorilla live, and we could never get that feeling, in our estimation, onto the records." Every regional scene in the Beatles era had a band like Tacoma, Washington's The Sonics. Usually these were beat combos quickly learning fast-tempo cuts to place at dances and the like. Here in the D.C. area there were bands like the legendary British Walkers (with a young Roy Buchanan on guitar) who thrilled my mom and her friends back in the mid-Sixties. In Tacoma, Washington, there was The Sonics, a now-legendary group that seemingly invented both garage rock as well as punk depending on what music critic you read. 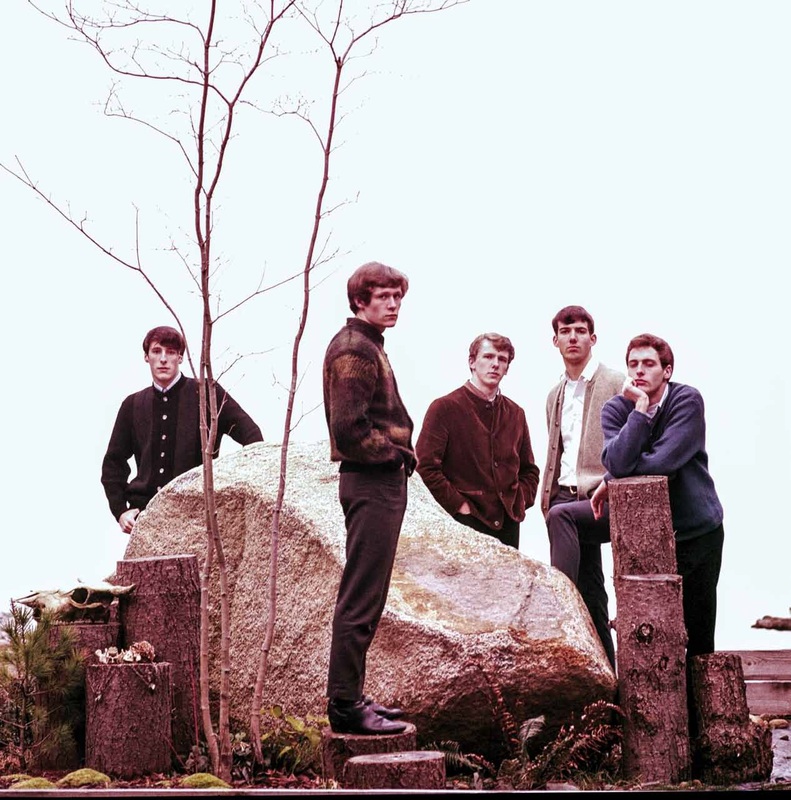 That The Sonics were incendiary is beyond doubt and if you want a crash-course in why there's still such a following of these cats, you'd be well-served by the upcoming The Sonics: 50 box set from Light in the Attic Records. Dropping tomorrow, on Black Friday Record Store Day, this amazing set contains some of the most vital music you're going to hear in 2015. That most of the music was made 50+ years ago adds to myth of The Sonics; how can music this old sound so fresh and downright threatening in spots? After listening to The Sonics: 50, I understood why the music of these guys survived when thousands of other bands' stuff has been long forgotten. Like The Ramones, The Sonics stripped rock back to the basics, subverted the typical love song-formula, and rocked out with abandon. It's that simple. Arguably the first important American band, The Sonics refined a template here and it's one that's been used by acts as disparate as The Stooges and The White Stripes decades later. Disc 1 contains Here Are The Sonics (1965), Disc 2 contains Boom (1966), and Disc 3 is full of rarities including a bunch of Christmas-themed cuts from the band. Despite some differences in production and original label-backing, discs 1 and 2 are full of immediate, punchy rock. If you only know Nuggets-era standards like "The Witch" and "Strychnine" then you only know one aspect of the band. As great as those cuts are, the band was capable of covering the hits of the day with ease and abandon ("Roll Over Beethoven" on Here Are The Sonics and "Louie Louie" on Boom). If those cuts were surely just recorded versions of the sort of stompers the band would trot out in live gigs, the album renditions still pack a wallop. If nothing else, they indicate the steamroller effect of the band and one can easily imagine how these would have gone down live in some sweaty club 50 years ago. A large part of the force of The Sonics' sound is owed to revered drummer Bob Bennett. Through a mix of primitive recording techniques as well as Bob's unique skills on the kit, the band used the percussionist as a force of nature behind their wall of noise. ANDY PARYPA (Bass Player, The Sonics): "The whole band played to Bob [Bennett, Drums] and that changed our whole approach to everything, really." And one remembers that quote from the informative liner notes booklet as one listens to Discs 1 and 2. On stuff like "Psycho" the entire force of the song starts with that beat. The drums sound like Bennett is playing right behind you. On stuff like "Dirty Robber" the sax anchors the cut as a party tune even if Bennett plays like he's inventing the Ramones with every hit on the kit. Another highlight here is "Boss Hoss" which remains the sort of tough-and-odd lost classic that is aching to be rediscovered and put on a Tarantino soundtrack. If Discs 1 and 2 are full of the very stuff of the bedrock of, well, rock, then Disc 3 is more of the sort of rarities disc that diehards will enjoy more than others. Full of some mildly misguided-but-still fascinating Christmas-themed tunes, the set also has a few alternate versions too. The big non-holiday highlight here is probably "The Hustler", a ditty penned by piano and organ player Gerry Roslie. Cut from the same mold as "Dirty Water" by The Standells, the song is a blast of snarling energy. Another classic that warrants rediscovery. GERRY ROSLIE (Piano and Organ Player, The Sonics): "After all these years, the interest in The Sonics is amazing to me; I’m dumbfounded. It’s great!" I don't think it's too surprising that The Sonics are so fondly remembered. There's attitude here in spades and besides the beat of Bennett, the band acquit themselves admirably. Bridging that beat era stuff with a darker edged kind of garage rock, the tunes of The Sonics still hold up in large measure. 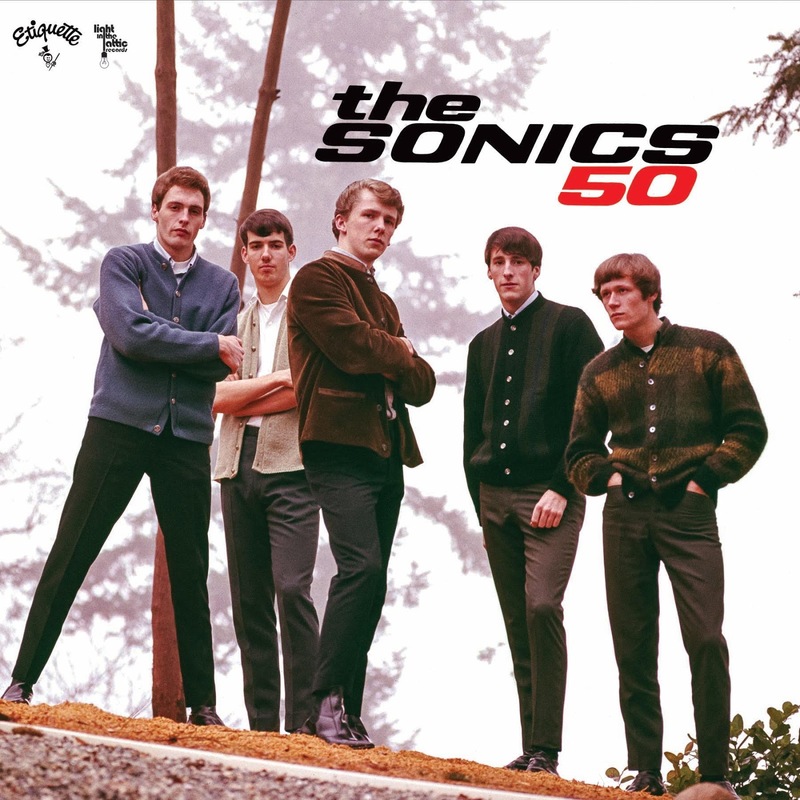 The Sonics: 50 is a concise and easy way to dive into this band's back catalogue. The fantastic liner notes -- loaded with awesome pics -- add to the allure of the band. The Sonics: 50 box set is out tomorrow from Light in the Attic Records.